A brand new option for high-end NFL collectors, 2018 Panini One Football features one card per box that is a hard-signed autograph. While the debut brand is fairly expensive when you break it down, box prices aren't outrageous because each box has only a single card. The premium release delivers every card encased in a one-touch holder. Another plus for collectors, each slabbed card is printed on canvas or acetate stock, and all relic swatches utilize prime or super-prime patches. 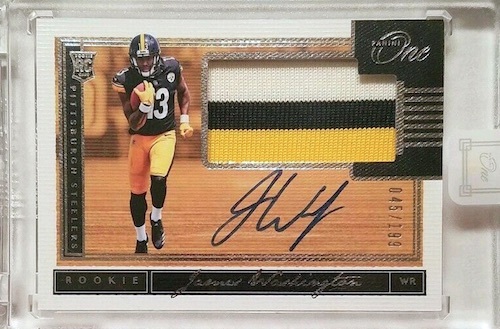 In fact, Panini revealed that approximately 85% of the cards in the entire run feature patch autographs. While they only represent about 15% of the cards, the 2018 Panini One Football checklist does have on-card autographs without relics. 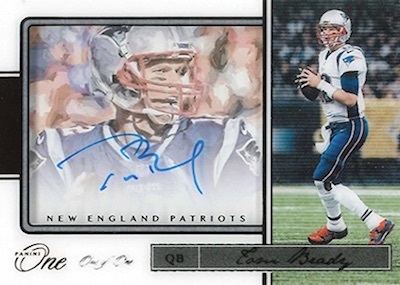 The main Autograph Bronze line (#/49 or less) has an artistic style and a shadowbox design. There are Red (#/25), Gold (#/10), Platinum (#/5), and Black (1/1) parallels, which apply to every other insert in the product, as well. 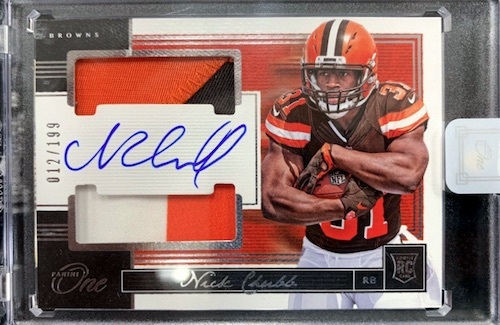 Another hard-signed choice is found in Rookie Autographs (#/199 or less). These have Blue (#/99 or less) parallels in addition to the standard versions mentioned above, as do all the other rookie sets. 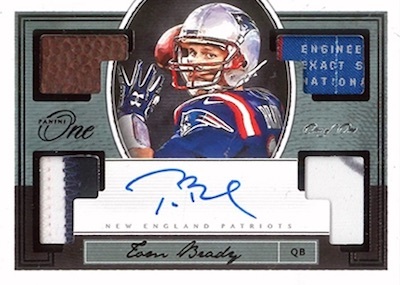 However, most of the action takes place with 2018 Panini One Football autograph patches. Top first-year stars come in Rookie Patch Autographs and Dual Rookie Patch Autographs. Each card is limited to 199 or less. The Premium RPA line drops that to 99 copies or less. Key veterans and retired stars are part of Patch Autographs (#/49 or less), Patch Autographs Variations (#/49 or less), which is a set printed on acetate, and Dual Patch Autographs (#/49 or less). Really working in some memorabilia variety, the Quad Patch Autographs set (#/99 or less) promises a "checklist full of Hall of Famers." HOT 2018 PANINI ONE SAQUON BARKLEY RC DUAL PATCH AUTO RED # 25 GIANTS INVEST!!! LEGEND 2018 Panini ONE Emmitt Smith ON CARD AUTO SSP #1 15 (eBay 1 1) COWBOYS!! See specific parallel print runs using the Excel spreadsheet below. View available 2018 Panini One NFL cards on eBay. PARALLEL CARDS: Blue #/99 (Jackson #/35*), Bronze #/49 (Jackson #/25*), Red #/25 (Jackson #/15*), Gold #/10, Platinum #/5, Black 1/1. PARALLEL CARDS: Bronze #/49 or less, Red #/25 or less, Gold #/10, Platinum #/5, Black 1/1. PARALLEL CARDS: Blue #/99 or less, Bronze #/49 (Jackson #/25*), Red #/25 (Jackson #/15*), Gold #/10, Platinum #/5, Black 1/1. PARALLEL CARDS: Blue #/49 or less, Bronze #/25, Red #/15, Gold #/10, Platinum #/5, Black 1/1. PARALLEL CARDS: Red #/25 or less, Gold #/10 or less, Platinum #/5 or less, Black 1/1. PARALLEL CARDS: Red #/25 or less, Gold #/10 or #/5, Platinum #/5 or less, Black 1/1. PARALLEL CARDS: Red #/15 or less, Gold #/10 or less, Platinum #/5 or less, Black 1/1. PARALLEL CARDS: Gold #/10 or less, Platinum #/5 or less, Black 1/1. 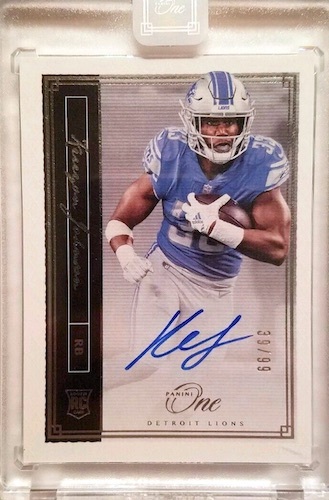 Shop 2018 Panini One NFL autographs on eBay. View the full 2018 Panini One Football checklist spreadsheet. Great product with great list of player autos!!! Love that they are full of Hall of Fame players. Featuring 100% ON-CARD Autographs! ALL Patch Cards feature Prime or Super Prime material and ALL cards will be produced on premium acetate or canvas stock! So you’re telling me you could be paying $119 for potentially a Bo Scarbrough or Mark Walton auto out of 199 and nothing else. Haaaaard pass. Mass production of rookie autographs with over 80% of the cards being rookies. Be careful. It is not limited and very expensive. About 1400 20 box cases. 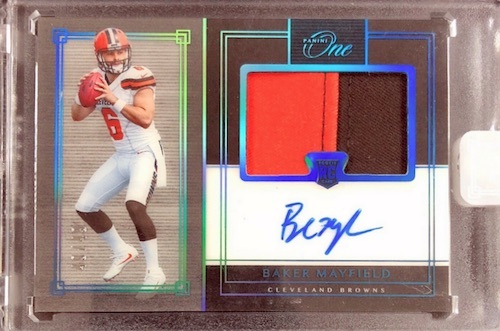 900 Baker autos…too many. Beautiful Product and perfect price point. I think Panini finally got this right. If they raise the price dramatically next year they will have lost me. Another big zero for all the suckers out there. Redemptions, high number garbage players, and oh, and gotta love that new math release date, a 2018 product two months into 2019! Sorry, Panini. Another complete PASS. Watching customers open many cases was very exciting! I only wish I had more. My brother and I both got a box, and we both got 2 bad rookie cards. Only signatures and no memorabilia. They say it’s 85% of cards have memorbilia which I don’t believe our luck is that bad. I see Keenan Allen in the checklist, but can not find any record online of a card of his in this set. Only thing on eBay is spots in a player break of his, but no cards sold or listed. You would think with the amount of product being broken, a “common” card in this set would surface pretty quickly. Same on watchcount.com. Trey, do you have any info on this? I’m wondering because I got him in a random player break and I want to know if I have no chance at a card or not. Any info is appreciated. Thank you sir. It is odd but we have not heard anything about this so far. The Keenan Allen thing is also true of Tyreek Hill. He’s on the checklist with a fairly high number of autos, but can’t find a single one anywhere including the “sold” ebay listings. This smells. I checked the other day for an updated checklist but it was the same. 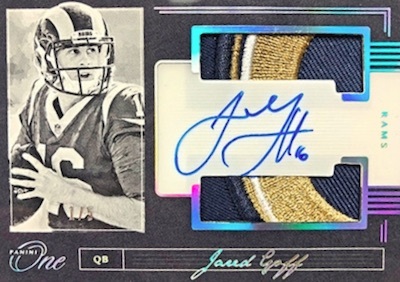 Today, however, the Patch Autograph subset had a pretty big difference. Trey, I double-checked the checklist minutes before posting my comment on Tyreek Hill. He was still on there prior to my post and now he’s nowhere on the checklist? What would explain that? I have a picture of him being on the checklist if you’d like me to forward it. I just updated the checklist on this site today based on the changes on the Panini checklist. The explanation is that Panini recently updated the checklist. Trying to complete the rpa set. Has Kyle Lauletta on check list but have yet to see one. He’s on the checklist but we haven’t seen an actual card for him. I took a chance as I loved the cards overall. 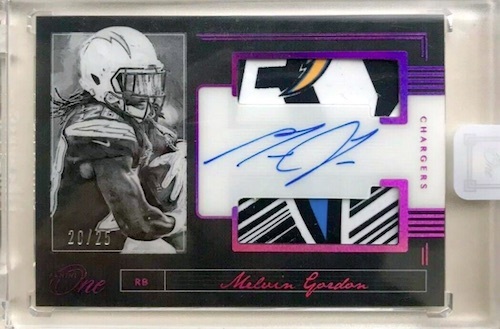 I seemed to have hit a Ladainian Tomlinson Single Patch Auto – Gold numbered to 10, but can’t see that on the checklist or find it anywhere online. Not sure what I have here, but I love the card. Any help? A full case has 20 boxes. But there are also inner cases with 10 boxes. An inner is half a normal case.